It's easy to record and mix audio clips with the rest of your composition: you can even drag-and-drop existing audio files from your desktop's file manager straight onto the main window, and arranging audio tracks is just like arranging MIDI ones. Move, snap, resize, zoom, repeat, and let Rosegarden's sample-accurate audio engine do the hard work. 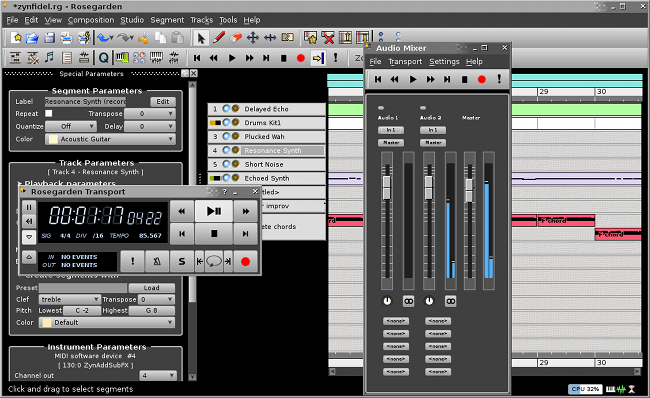 There's a capable but straightforward audio mixer window to adjust levels and audio routing. You can have as many audio tracks as your hardware will support, and route them through up to eight submaster groups with five insert effect slots per track. Rosegarden uses the Linux standard LADSPA plugin API, so it supports hundreds of existing free plugins – and for those with an engineering bent, the open and easy-to-learn plugin standard makes it a fun platform for studying signal processing and developing new effects.